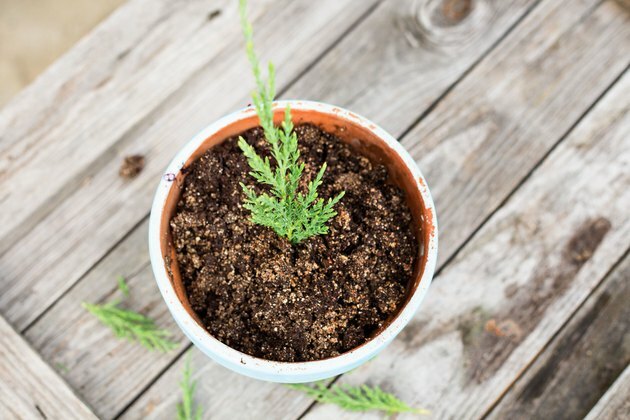 Cuttings from your healthiest juniper (Juniperus spp.) trees and bushes effectively clone the plant so any new plants have the same desirable qualities. Junipers, which grow in U.S. Department of Agriculture plant hardiness zones 3 through 9, come in two main varieties. The prostrate forms, which grow as low-growing, spreading shrubs, root most readily from cuttings. 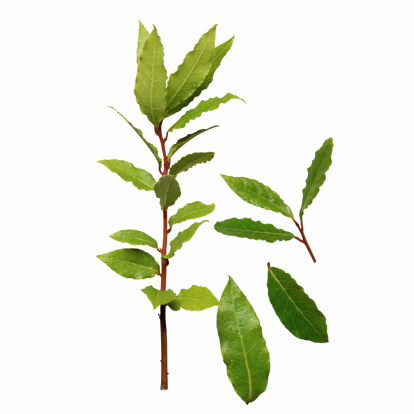 The upright varieties that resemble trees, are more difficult or they may take longer to produce roots. Take juniper cuttings in summer as the new wood begins to harden and mature, but before it becomes completely woody. 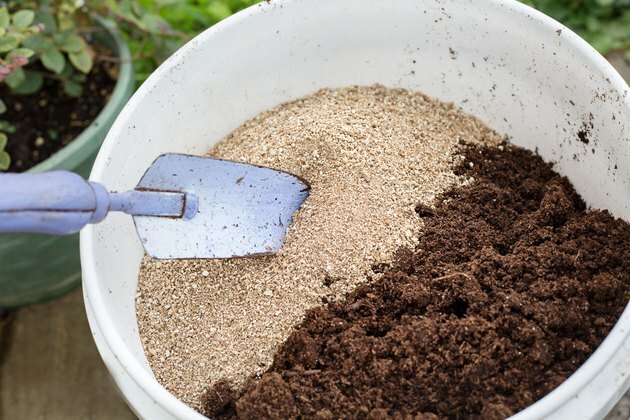 Mix equal parts peat moss and perlite together in a bucket. Stir water into the potting mixture until it's completely moistened. Allow the mixture to absorb the water for 30 minutes, and then add more water if it still feels dry. Fill a 6-inch pot with the moistened mix. 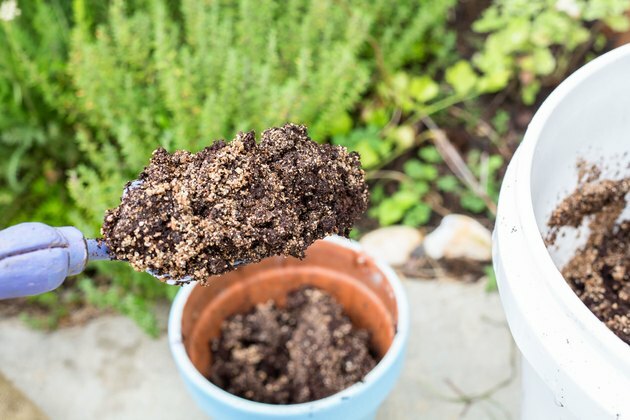 Use a pot with at least one bottom drainage hole and drip tray so excess moisture can freely drain from the soil. 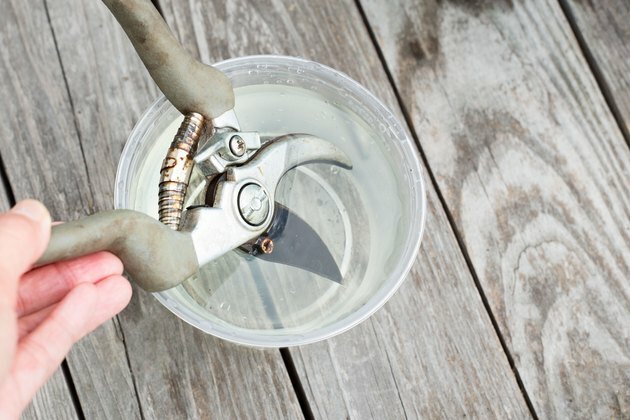 Soak a pair of bypass shears in a solution of 1 part bleach and 9 parts water for 30 minutes to disinfect them before taking the cuttings. Cut a 6-inch tip from the juniper, making the cut at the joint where the new growth joins the old branch. 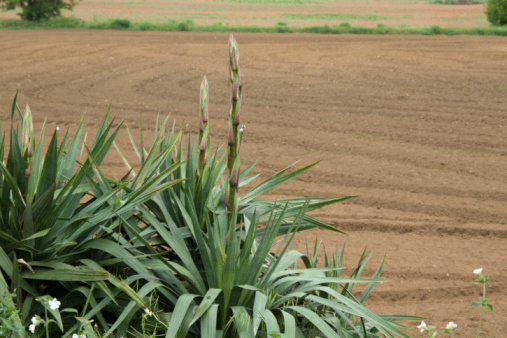 Select a branch from the current season's growth that has begun to harden and has produced fully mature needles. Strip the needles from the bottom one-third of the cutting, leaving only the needles near the stem tip in place. Dilute a liquid rooting hormone IBA concentrate to 5,000 parts per million in water. 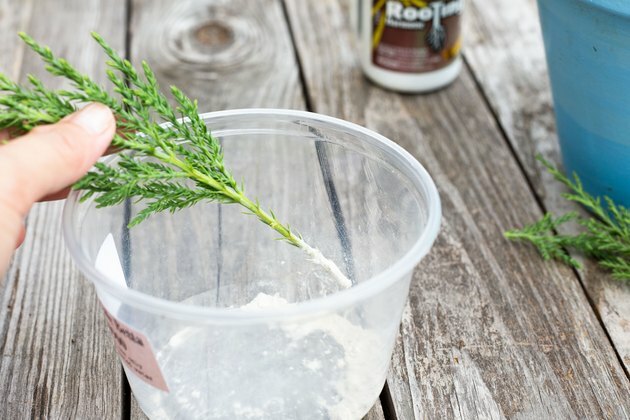 Dilution rates may vary by brand, but generally mixing 1 part hormone to 1 part water in a small bowl results in the correct dilution for juniper. 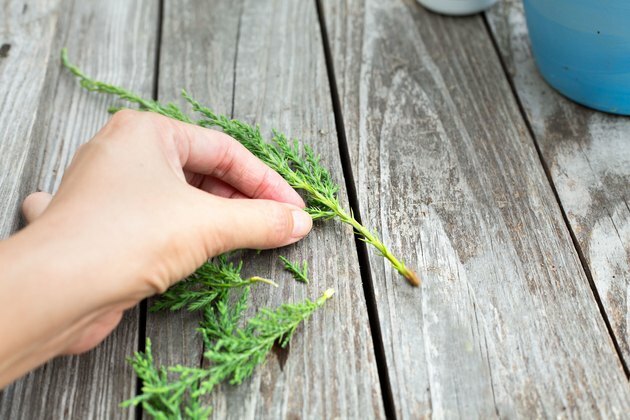 Dip the cut end of the juniper stem in the rooting hormone, coating it thoroughly. 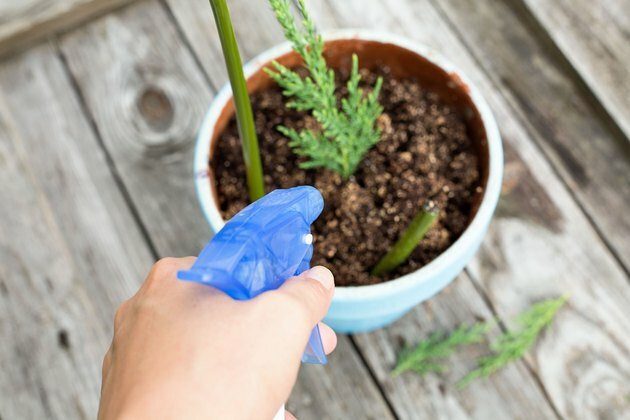 Insert the cut end of the stem into the potting mixture, burying the lower one-third to one-half of the stem in the mixture so it remains upright. 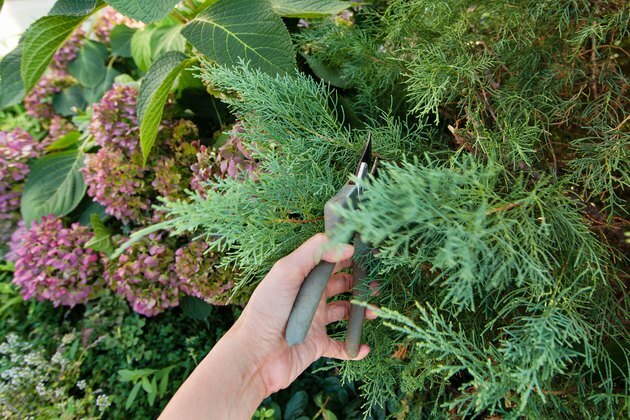 If you plant multiple cuttings in a single pot, space them 2 inches apart. Mist the cutting with water from a spray bottle. 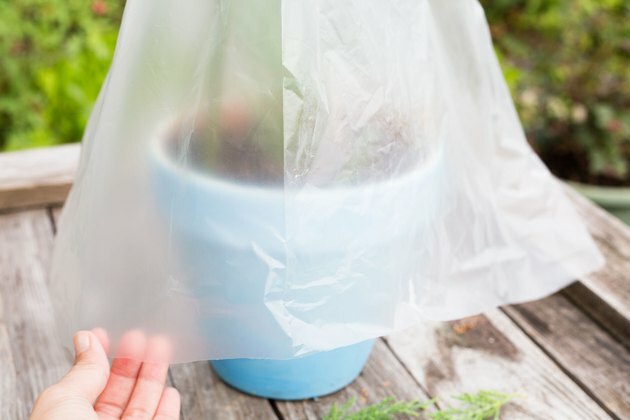 Cover the pot with a clear plastic bag, arranging it so it doesn't touch the cuttings. Set the pot in a warm area with bright but indirect sunlight. Remove the bag and mist the cutting daily to keep it moist. Water the potting mixture if the surface begins to dry out. Empty the collected water from the drip tray after watering. 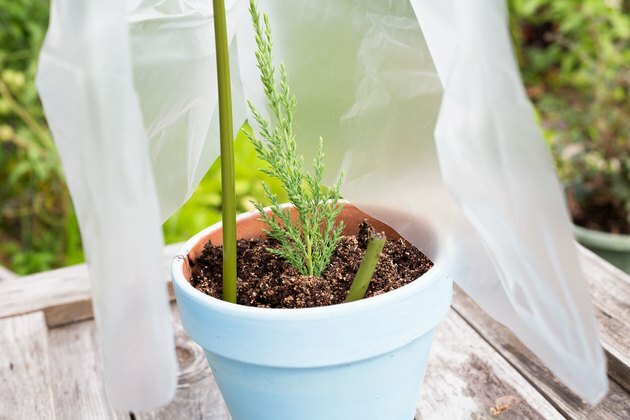 Remove the bag once the cuttings root and begin producing new growth. 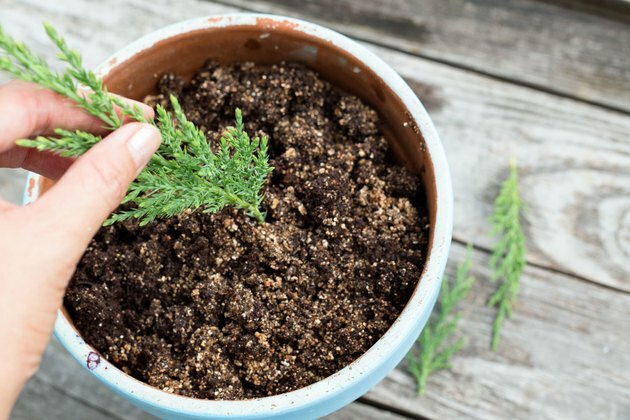 Rooting time varies depending on the type of juniper, with fast-rooting varieties like "Bar Harbor" (Juniperus horizontalis "Bar Harbor"), which grows in USDA zones 3 through 9, requiring as little as four to eight weeks, while varieties like Chinese juniper (Juniperus chinensis), which grows in USDA zones 4 through 9, requiring up to 24 weeks to root successfully.